Thank you for sharing your orthodontic story. Can you please tell us how you decided to learn orthodontics with POS? When I started POS in 2014, I was an associate who wanted to start my own practice and help orthodontic patients. At that point I had taken 6 Month Smiles and Invisalign and had enjoyed learning a little about orthodontics there. But I found out that this limited knowledge wasn’t enough to help me treat orthodontic patients. 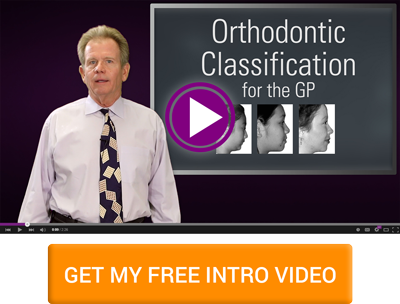 I knew that I needed more education and decided to take the Comprehensive Orthodontic Series after finding it on a Google search. I found that I needed to know more than just a quick fix and was drawn to POS to help me get a thorough understanding of helping my ortho patients. How did you initially learn when you joined POS’ program? I initially decided to join the Chicago 2 series. This was part of the Traditional format, with 12, 4-day seminars scheduled. At that time it was pretty easy for me to drive three hours from Indiana and attend the series every month or two. I liked the idea to learn in a traditional classroom setting, and it was really fun. What was it like to learn orthodontics as an associate? Unfortunately as an associate about to move, I didn’t have time to start any cases when I first joined POS. Although instructors encouraged us to treat patients early, my husband and I were leaving our jobs in four months so it was impossible to start an orthodontic case in my situation, even though I wanted to. Theoretically I knew a lot of orthodontics from listening to lecture, discussing cases and strategizing treatment plans with instructors and classmates. I learned a lot and it made me a better dentist, but I did not have the same understanding of ortho as I do now that I started real cases to learn with. I remember that you found out that you were pregnant a few months after starting the course. How did that affect your education? Yes, right after Seminar 4, my husband and I found out that we'd soon have the pleasure of welcoming a baby into this world. We moved to a new location and started our own practice in Indianapolis. It was a very busy time for us. With a little one to care for and a new practice to build and run, it was hard for me to be away. But I knew that I needed to learn orthodontics; it was something I really enjoyed learning and I knew that we needed it in our new practice. So I took some time to settle into our new home and routine then switched to the IAT format. At this point I was ready to start a few cases. I kept studying hard at home and am grateful that I had the help of instructors. I remember with all of these great things happening in my life, that I was both excited at the possibilities, but also nervous. I never thought that I’d be able to be so successful with an online learning format, and was initially hesitant to choose this as an option. Were your fears of this online learning format realized? Did you miss out on anything in the IAT format? I did lose out on seeing classmates and friends regularly. Although I missed the social part that I had with the Live Series, I found that there was no difference to my understanding, clinical abilities or education. How was learning orthodontics with more online studying? The IAT program made it possible for me to do something I otherwise would have had to give up. The Live option was a lot of planning, driving, and time away. If I lived closer to the Live venue, it could have been feasible. But after having a baby and managing multiple practices, IAT was the best decision for me, and I truly enjoyed it. It has given me great flexibility. I liked how my IAT group was a smaller batch and was more intimate. I honestly prefer smaller groups and this made IAT very enjoyable. I felt like I knew my colleagues well and this gave us better discussions. As an IAT student, everyone already knows the concepts pretty well because they studied before. You could say, everyone’s been primed. I was initially concerned that I wouldn’t be able to access instructors or learn as much as in the Live series. But instructors are always available to talk, even with the IAT program. I was very happy with our instructor, Nina. I communicated with her a lot with case consultations and through emails with her. 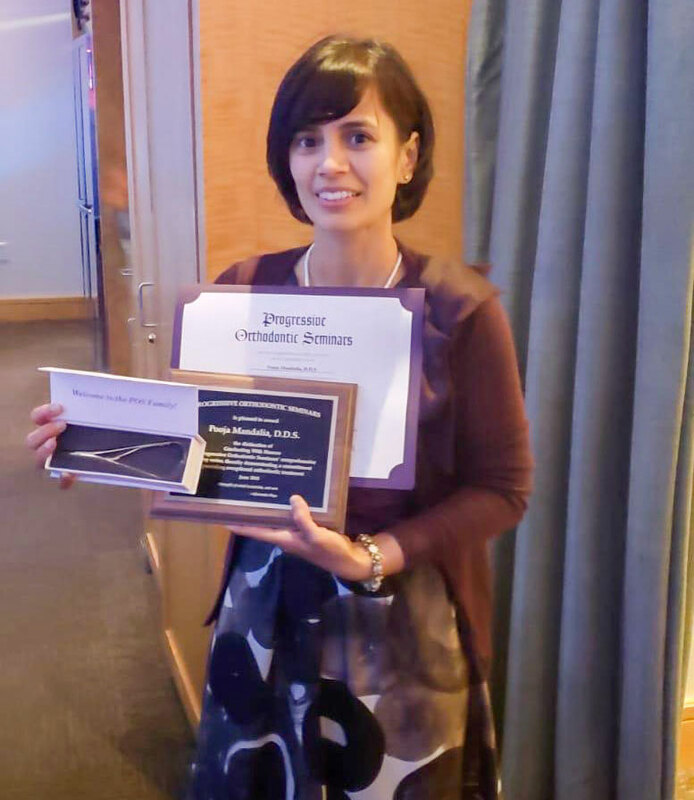 Dr. Mandalia at her graduation from POS' IAT program in Boston. How did you study when in the IAT program? How did you stay motivated? With IAT, you have to be quite motivated to study and be successful. I scheduled in 30 to 60 minutes each work day to study orthodontics and design my cases. I dedicated a little of my time to orthodontics every day at the office (since I didn’t have downtime at home). While I could have tried to watch a seminar over a whole weekend, I knew I’d be too overwhelmed and would not be effective that way. During this time I watched the seminar video recordings first then looked at the cases to drive home the concepts. Everything you need to know is in the videos. I watched and re-watched the videos and continued to pick up helpful information. There was always something interesting to learn. Learning orthodontics is rewarding on many levels. But the only way I’d be profitable in it was to increase my numbers, so I was motivated to study daily. I’m impressed with how you were able to be successful while juggling so many things in your life. Can you share how you were able to manage orthodontics when life felt too busy and provide tips? I recommend to every student, even if it’s daunting, to start working on cases. I didn’t learn as much until I did. The only way I was able to learn was to get my hands and feet into orthodontics. I started a few patients then, and now have started 65 cases. I really want to help 100 patients with orthodontics by the end of this year. Also, it’s a great idea for every ortho practitioner to train their assistants. It’s not possible to run a high-level orthodontic practice unless you get someone on board with you. Orthodontics can take a lot of time, especially on a high level. I have a trained ortho assistant. I sent him to POS’ Dental Assistant Training class. He does tracing, takes photos, changes archwires, etc. So I’d highly recommend to get your staff excited and involved from Day 1. Wow! How do you get so many patients wanting your orthodontic care? I screen every single patient that comes to my practice. This is a great and easy way to get patients and truly help them. Also, some patients are willing to give us a video testimonial, which we post on Facebook and our website. This is all quite easy and doesn’t cost us any marketing budget. Now that you are an experienced graduate, what are your thoughts on orthodontics? Ortho is so satisfying. I started loving ortho from the beginning, even before we opened our practices. Patients trust that you can do anything. It’s great. I remember how a young 12 year old patient hugged me and said “You changed my life!” At deband she actually smiled. Before she would not. It’s nice to be the good guy. It’s truly rewarding, not like numbing someone up for a procedure. In addition to it making my career feel more rewarding, comprehensive orthodontics has been a great practice builder. How was your experience at POS? It has been my best career decision. I have gotten a lot from the program. I tell all my friends to join POS and start treating orthodontic cases. I’ve always wanted to do ortho and never had the time to go to residency to get my specialty. This program, and having it available with online content, was the only way for me to do something in dentistry that I truly enjoyed while allowing me to grow a family and build my practices. 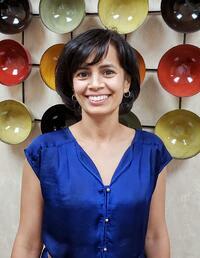 Liked Dr. Mandalia's story? Check out the story of another successful POS graduate.